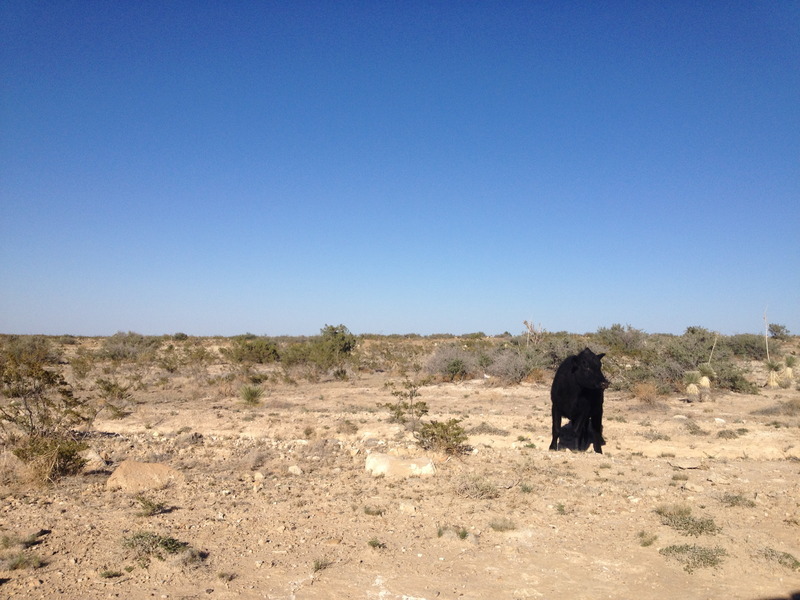 The drive from Balmorhea State Park to Carlsbad, New Mexico was empty. Not in an interesting way, like our first taste of no-gas-stations-for-80-miles West Texas along the scenic-ish Interstate 10. This drive was flat and boring with absolutely nothing for miles upon miles. The very few tiny towns we passed through looked sad, dilapidated and dried up. We didn't take any photos because there weren't any worth taking. But we were in a great mood. We had spent all afternoon swimming in the best pool in the world, we were headed to a brand new state that John had never been to before and we were planning on boondocking near the caverns for the first time. Exciting stuff. For those of you not hip to the RV lingo, boondocking is camping somewhere for free with no hookups or amenities. The Bureau of Land Management and the National Forests both have designated areas and campgrounds all over the country. Walmart parking lots are a popular place to boondock, that is if you aren't picky about scenery. Anyways, I found this spot on a free camping website and the reviews were decent. What's the worst that could happen? Might as well give it a shot, right? No. Photos don't do this hellish road justice...it looks fine, but it did not feel fine. The reviews failed to mention the horrendous state of the "road" that led to the campsite. 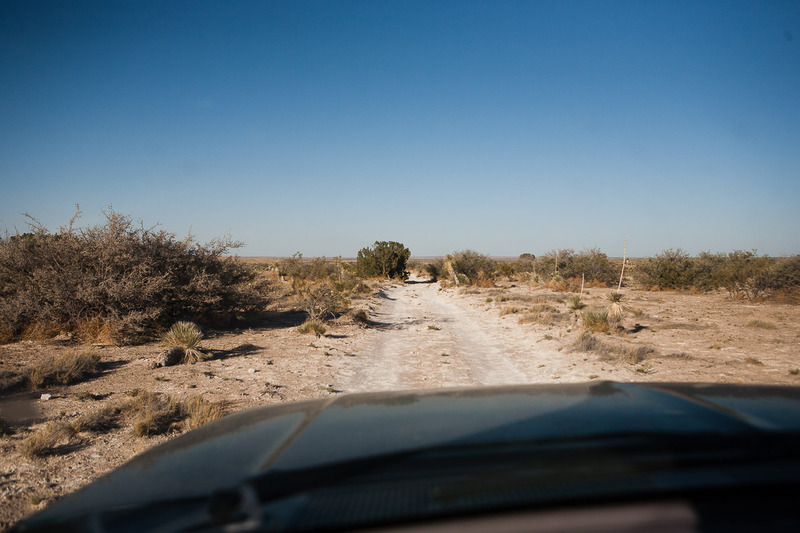 It was narrow and dangerously uneven with boulder-y rocks jutting out that we had no choice but to drive over. Because there certainly wasn't anywhere to pull a U-turn. Thorny tree branches hanging into the road were pushed aside and ran down the length of B.B. and Loretta, leaving fine, painful-sounding scratches. After four miles of treacherous road that threatened to overturn the trailer, we made it to the roped-off campsite (we were pretty surprised that it even existed) but realized we were too long to get in. The point at which we gave up and somehow managed to turn around. 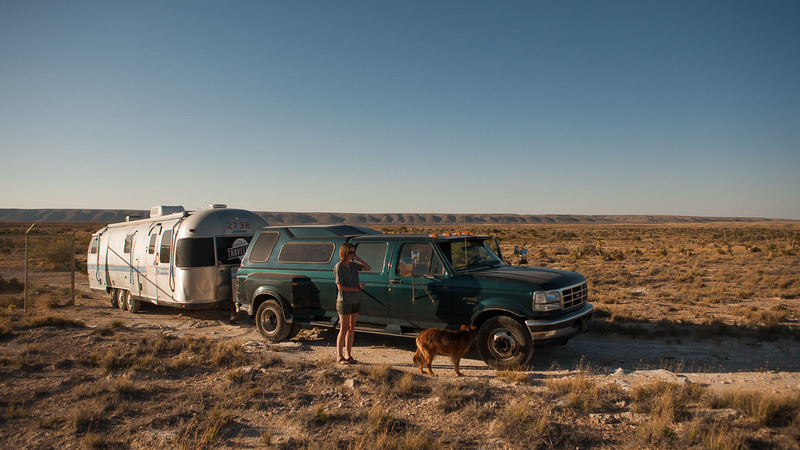 Frustrated and tired, we cursed boondocking and the stupid deserts of New Mexico. We decided to turn back and find a real campground before the setting sun slipped down below the mountains. We had to relive the horrors of "road", but we finally made it out. Asphalt has never felt so good. 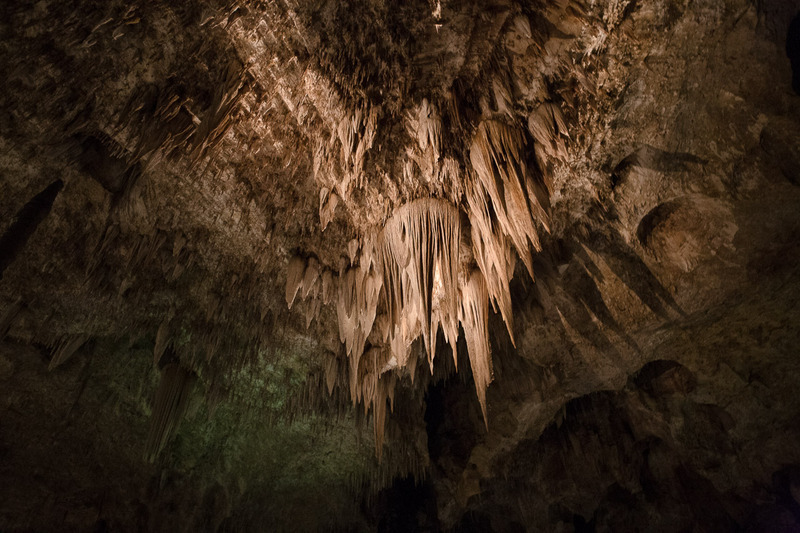 The next morning, we drove up the road to Carlsbad Caverns National Park. The entrance to the caverns is located on top of a ridge in the Guadalupe Mountains and overlooks the flat desert below. It was National Parks Week, so we got in for free! Woo hoo! We were short on time; the RV park we settled on after our boondocking fiasco had a 1pm checkout time. So we opted to take the elevator down to the Big Room instead of spending an hour hiking down through the natural entrance. Posted at the beginning of the natural entrance. 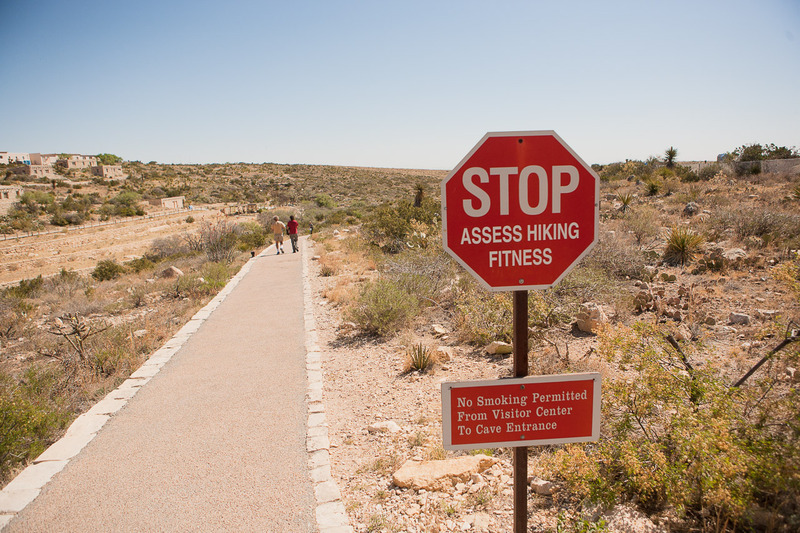 How honest do we have to be with ourselves about our "hiking fitness"? 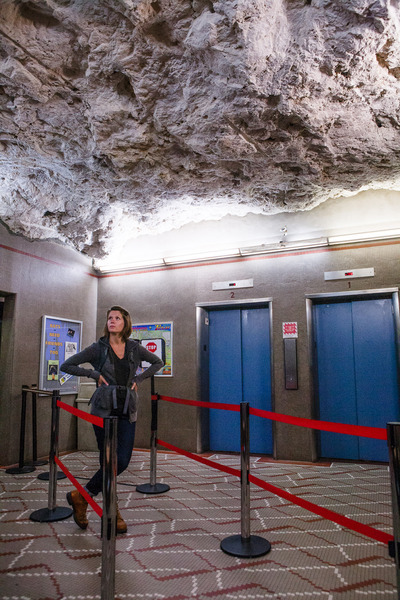 The elevator system at Carlsbad Caverns has been in place since the 1930s and drops 754 feet at a speed that rivals the Empire State Building's elevators. The doors open up to a gift shop and cafe inside the cavern. It was very bizarro and retro-futuristic to have this fluorescent-lit snack bar surrounded by natural rock so deep underground. 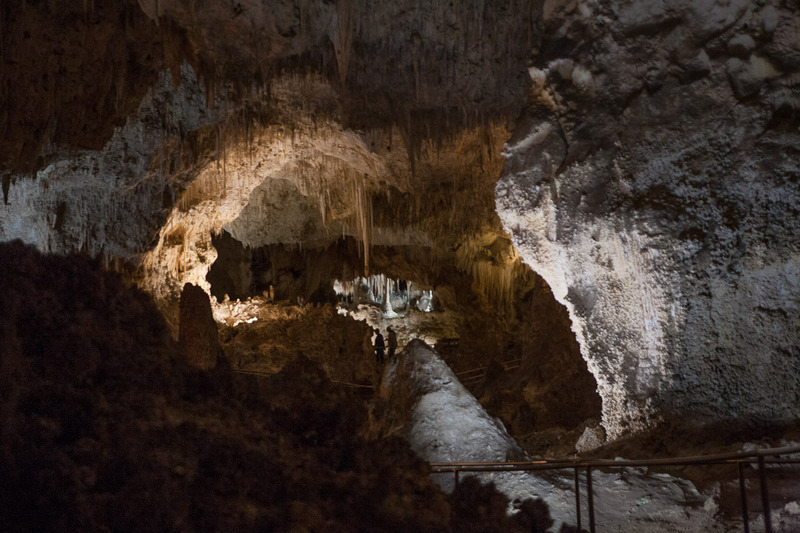 We began our self-guided tour of the Big Room, a one-mile, paved and railed "trail" through the largest and most famous cave within the caverns. In fact, the Big Room is so big that it can fit over six football fields inside. How bananas is that! 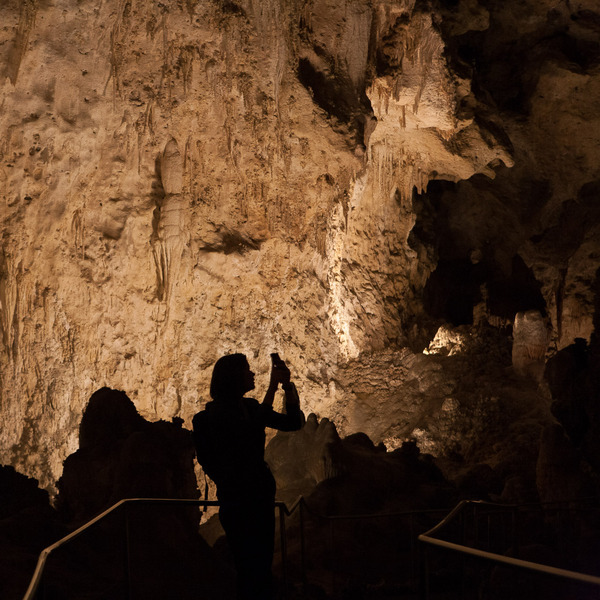 The caves are very dimly lit, with spotlights highlighting particularly interesting stalagmites, stalactites and other rock formations. It's a cool 56 degrees down there and humid, a stark contrast from the hot dry desert hundreds of feet above us. We walked through the Big Room, stopping to marvel at impressive formations, like the Giant Dome, the Chandelier and the Rock of Ages. The variety of color and shape of rock formations was astounding. Stalactites hung from the ceiling like icicles and curtains blowing in the wind. Stalagmites rose up form the ground looking like cauliflower florets stacked on top of one other (those were my favorite). There were formations called soda straws (that looked like soda straws) and popcorn (that looked like popcorn). We tried taking photographs, but it was too dark and there was no way to convey the scale of these incredible formations that have grown over thousands of years. Being down there in the caverns reminded me of being in a cathedral. People around us whispered quietly while walking reverently through the lofty space, as one would while touring one of the famous cathedrals of Europe. We aren't exactly religious people, but being in the presence of the rare and hushed beauty of Carlsbad Caverns was a spiritual experience. After nearly two hours of exploring the Big Room, we made it to the end, back to the underground cafe and gift shop. We picked up an obligatory postcard on our way out. I couldn't help but think how weird must it be for the guy who works at a snack bar inside a cave. Special thanks to Alex B. 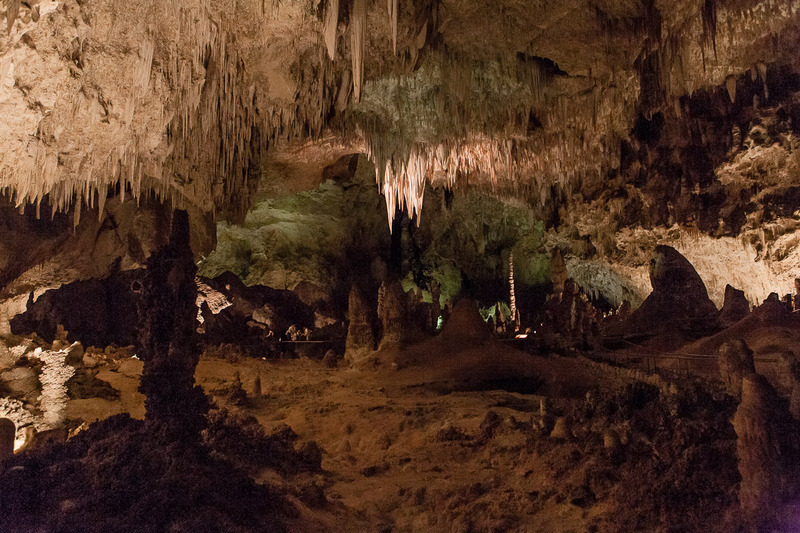 (who suggested hike through the caverns) for making this blog post possible!